DEGREE OF FREEDOM ENIGINEERS (DOF) is an international civil and structural engineering practice based in Oslo and Valencia, with a focus on high-quality architecture. DOF distinguish themselves as experts of special structures with complex geometry, like art installations, footbridges and road bridges and buildings. 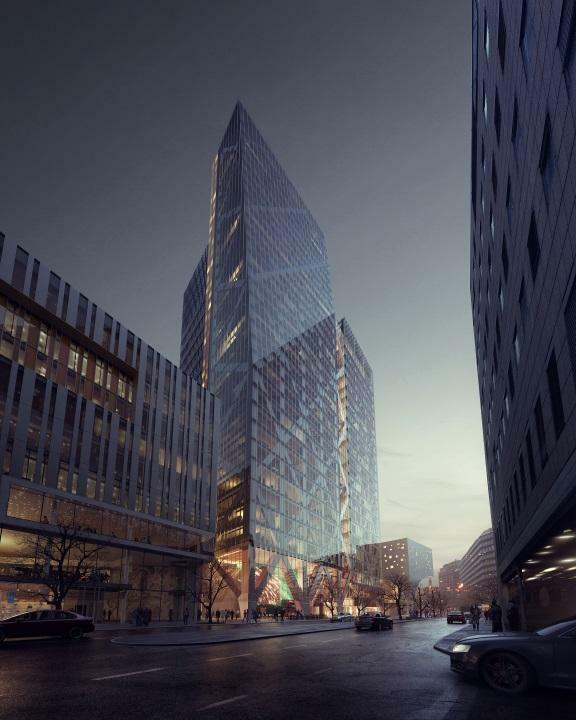 Recently they participated together with architects SAAHA and energy experts Gether (both Norway) in a competition for the renovation and extension of Posthuset, a large office building in the centre of Oslo, where they proposed 'The Tallest Timber building in the World', photo right. Partner Gaute Mo: "We were one of the finalists in this Nordic competition, where we proposed a 32-storey timber structure. Unfortunately we did not win the competion in the end. The proposal was maybe too innovative for the client to go for on this important project. We now hope to apply the concept to a smaller scale project, to start with." DOF is an expert in complex bridges and buildings and are currently doing most of their work in Norway, where the climate and landscape require a special approach. The structural solutions of DOF imply traditional materials like steel, reinforced concrete and wood as well as less conventional materials such as glass, membranes and modern composites. DOF Engineers started in 2009, after the world-famous architect Santiago Calatrava closed down his office in Valencia. A number of engineers, who were working there, started a new engineering company together under the name of DOF, operating from Oslo and Valencia. Partner Gaute Mo emphasises that his international team has a lot of expertise in special structures and is very keen on working with architecs who are open to a creative contribution from the engineer. Gaute Mo: "We have 12 engineers in our team. Ten of them have been working for the world-famous architect, engineer and sculptor Santiago Calatrava. Actually we have 70 years of experience from working at Calatrava. While working for him DOF's engineers and draftsmen were involved in projects like the 2004 Olympics Stadium in Athens, the Opera House in Valencia and the Transportation Hub on Ground Zero and a lot of other large and special structures, mainly bridges and large public buildings." Gaute Mo: ”With DOF we do most of our work in Norway, but we are also doing projects in Sweden, Spain and Rumania at the moment." And then the bridges: DOF has a lot of experience in designing and building both structural complex and stylish bridges. Gaute Mo can look back upon a large experience with building bridges himself. He worked as Designer's Representative on the Samuel Beckett Bridge in Dublin, which was awarded Engineering Project of the Year in 2010, in Ireland. Gaute Mo: ”The design was made by Calatrava. First I was employed by him, then later he hired in my company to represent him on site during construction. In addition to doing the structural engineering, I also controlled the quality and the aesthetics of the site works. The bridge itself was built in Rotterdam and then shipped to Dublin. The original idea was to build the bridge over the river Liffey (in its final position) in Dublin, but the steel contractor (Hollandia, Rotterdam-based) proposed to build the entire bridge in Rotterdam at their fabrication yard, ship it to Dublin on a barge, and lower it down with the tide water on the support in Dublin. A genius idea!" Together with Multiconsult, DOF Engineers won the competition of the Munipality of Naustdal, in the traditional Norwegian district of Sunnfjord to build a bridge over the River Naustdal, where many tourists often come to fish salmon. Gaute Mo is happy they won the competition, but the politicians still have to decide whether to construct the bridge or not. "We did the architectural and engineering part, whereas Multiconsult did the planning, landscaping and infrastructure around the bridge." The client asked them to design two alternatives. Gaute Mo:"We have designed two possible solutions for the bridge. One is a suspension bridge and one a stress ribbon bridge (photo left). A stress ribbon bridge is a tension structure, where the suspension cables are embedded in the deck. So we made two conceptual designs for the pedestrian bridge crossing the 100 m wide river in the Fjords of Norway. The client asked for a signature bridge with an exciting design." The Naustdal bridge is far from being a standard footbridge. Gaute Mo: "The river itself is only 100 meters wide, but on each side of the river you have approximately 100 meters of fields, almost at the same level as the water in the river, so every year almost the entire area is flooded. That is a complex factor. So we had to design the bridge taking into account the flooding, and also the national road along the other side of the river. We needed to stay 6 meters above the road. As a consequence the bridge over the river, which is only 100 meters wide, had to be 320 meters long. It was difficult, in the way that we needed to find a real good and affordable solution for the municipality. I think we have found the two most cost-effective solutions possible, because besides an affordable bridge they also wanted something modern, something appealing, which would attract tourists, to put the village of Naustdal on the map. So the bridge will be a landmark. Another very exciting project we are doing at the moment is the competition for the New Hisingsbridge in Gothenburg. DOF is finalist in a team together with Snøhetta, WSP, ZUS and GGAU." The design team of DOF Engineers, NUNO Arkitektur and Multiconsult were the competition winners of a new modern footbridge over the canal in Flekkefjord with a high-quality architectural appeal. It is a steel footbridge, 54 m long, that can be opened for boats. It crosses the canal in four approximately equal spans. One central span is a bascule bridge, which means it is moveable with a counterweight, that continuously balances the span or "leaf", throughout the entire upward swing in providing clearance for boat traffic. It creates a 12m wide clear sailing canal in open position. The bridge forms a connection between the eastern and western part of Flekkefjord. The bridge is thin and slender and does not block the view from the city centre towards the fjord. In that way it respects and fits in well within the landscape. The fixed spans have a strong overall load-bearing capacity. The mechanical system for opening the bridge is concealed within the base of one of the pylons. The design has been made during 2012/2013 and the bridge will open to the public in 2015. St. Horto is the winner of the international competition Hortocontest. An impressive project that DOF Engineers have participated in, together with the architects Francesco Lipari, Vanessa Todaro (OFL Architecture) and Frederico Giacomarra. 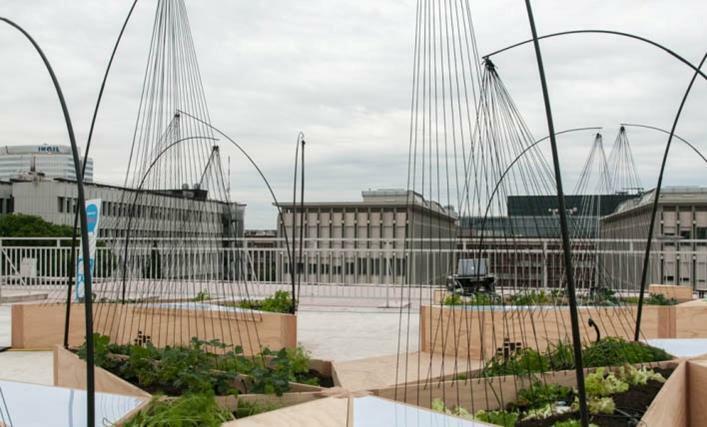 St. Horto is a dynamic roof top garden in Rome, a futuristic project in which a number of other consultants were involved. The engineer who represented DOF in this magnificent project was Felice Allievi. St. Horto was realized at this year's Maker Fair in Rome. It was created on the roof of a former Roman textile industry building, and transformed into a centre of cultural activities. St. Horto is a project that surpasses its contextual and design character. The principe is simple: to create an urban vegetable garden with didactic and architectural value, a project with high-quality technology and knowledge. 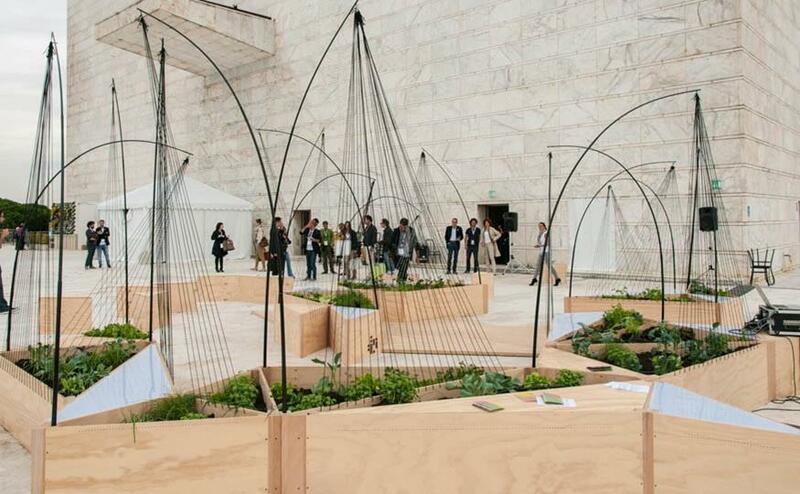 Showed for the first time at the Maker Fair in Rome, in 2012, St. Horto is the first prototype of an interactive garden that creates an ideal synergy between architecture, nature, music and social technologies. Architecture has a key role: the asymmetric but well-proportioned spaces, which are uneven but harmonious at the same time, create unusual tactile, olfactory and visual perspectives designed to provide a deep sensorial experience that could be suitable for children too. When you go into St. Horto, you are immersed in a dynamic space characterized by a sequence of solid an empty triangulations that provides mainly educational functions. St. Horto represents to the Maker Fair in Rome an explosion of technology, carpentry and advanced design techniques. Cultivation areas, sonic harps, dining seating and an interactive lighting system alternate within 31 triangular tanks. Furthermore, an accurate study on 93 nodes allows the project to have different triangulations that increase, in this way, its own technical complexity and originality. The St. Horto project will be exposed in New York until December 13th 2013, at the Cut 'n Paste exhibition, curated by Pedro Gadanho at the MOMA Museum in New York. The architectural landscape of harp-like structures was constructed on the roof of the Palazzo delle Esposizioni exhibition hall. The garden consists of 31 carefully-crafted wooden flower beds. 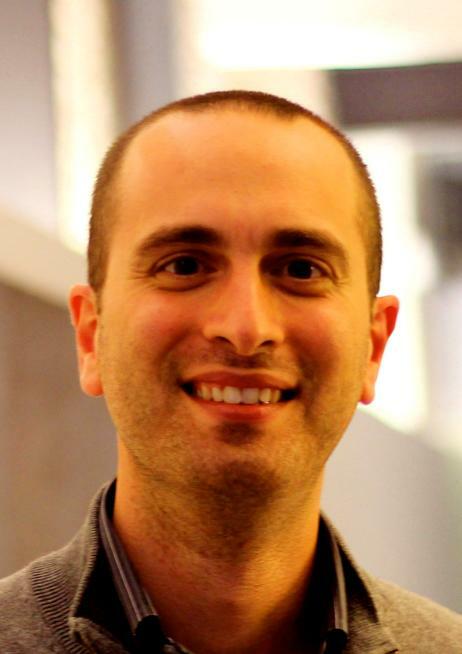 Creating a musical composition in real time, St. Horto combines sonic, interactive and educational elements. The music emitted depends on environmental variables such as wind speed, humidity and people's voices. The sonic harps are fitted with touch sensors as are the vegetables in the plant boxes, allowing visitors to manipulate the sounds by touch. St. Horto's educational value lies in its technological system, that allows the plants to be monitored in real time and managed by 'social' irrigation via Twitter and Paraimpu, a website which acts as a social tool to allow people to connect, use, share and compose things, services and devices online.